I stopped the DVD for a moment, tearing my eyes away from the screen. It’s early morning, perhaps touching slightly upon the 7 o’clock mark. For many, it be the beginning of a new day; for me, as it has been for the past several days, with my body clock being what it is, it is (perhaps) closer towards the end of one. My roommate, Bindu, is still awake. This holiday, he has been spending almost all of his days watching movies. I suppose he’s in a position where he can indulge that little desire of his; I consider myself a lucky man if I am able to keep up with my self-imposed ‘per movie per day’ idea. It is indeed an apt and succinct description of the whole film. It is a crazy film. It doesn’t help, perhaps, that the director, Lars von Trier, was himself suffering from a degree of depression by the time the camera rolled. But I’m jumping the gun a little, perhaps, for in order to sum up, I need to start at the beginning. The 'Beware of fox hole' signs needs updating. 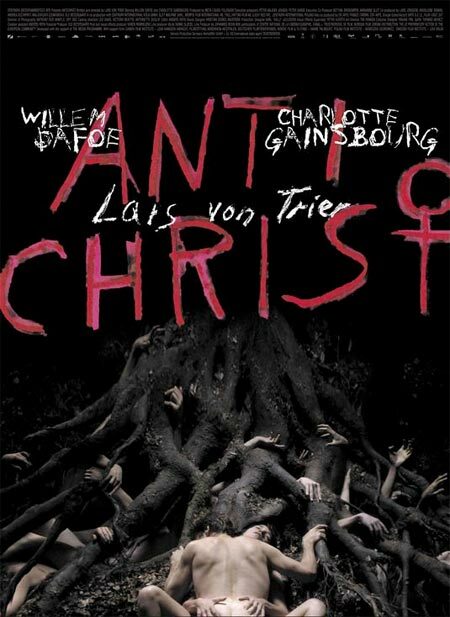 ‘Antichrist’ tells the story of a couple, He (Willem Dafoe) and She (Charlotte Gainsbourg), who had just lost their son. Unable to deal with the grief, She starts to have some mental and emotional problems, and He, who just so happens to be a therapist, tries to cure her through the use of exposure therapy (where people are encouraged to face their fears). He finds out that the one place that she is afraid of the most is a place called Eden. In order to try to help her get over her son’s death, he decides to bring her there, where things…well, starts to happen. And that’s basically the storyline. It really is. Not quite a lot, is it? And certainly not when we consider how dense the subject matter became by the end of the film. But what happens from that point on is a series of masterclasses in how to further symbolise what it is that you think or feel the person is going through. More importantly, it is a lesson in how the director exorcised his powers on you and made you feel the things that he wants you to feel. We are putty in the hands of Lars von Trier. In some films, the good ones, you’re able to somewhat connect with the main characters on screen. You’re able to identify with them, at least on some level. This means that, to some degree, you’d also be going through the emotional emotions that they themselves also go through. 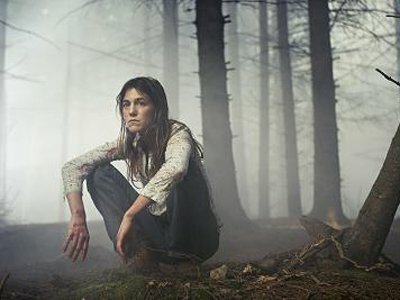 With ‘Antichrist’, you do feel somewhat connected at certain points. Unfortunately, what it is that you might be connected to would be their physical and emotional pain. A lot of coffee beans was expended to create the smoke. Without trying to give too much away, the moment I stopped at for a short while was a particularly gruesome one, when She had gotten hold of a rather vicious-looking drill and He…was knocked out. And she’s about to do something to him. In another scene, she is naked, spread wide open…and she’s holding a pair of scissors. It is not exactly what you might have in mind reading that, but it’s enough to put you off a bit at least, don’t you think? It is these kinds of things and images that evokes the very strong feelings that made me feel like I want to tap in submission. Even now, I am still able to recall how I recoiled at these images (and am really glad no one has hit me in the balls for a while). There is a coherent meaning to be looked for within all of these…these…pain, but in that moment, right when the hammer’s about to fall, or the scissors’s are about to snip, you’re not going to be thinking that straight. At least, I wasn’t. I wanted to tear my eyes away from the screen, and not watch any further. As it so happened, several people have fainted while watching this movie during its run worldwide, so I suppose I’m not alone in this. It’s a pity, somewhat, because ‘Antichrist’ is beautifully shot. There’s a bunch of dream sequences, during which She tries to explain to him what she has been feeling, and he tries hard to help her in return. Shot at a rate of 1000 frames per second (the standard speed for film is 24 frames per second), you can imagine how slow these sequences turned out to be. They’re so slow that it became incredibly picturesque. The colours are also incredibly vivid, so much so that if you rest your eyes slightly, you could fool yourself into thinking that you’re looking at a painting from the Louvre. Lars von Trier and the cinematographer, Anthony Dod Mantle (he of ‘Slumdog Millionaire’ fame) has created such wonderful images (on digital video too, I hasten to add), but it becomes a tool in the end to inspire more pain, as I think the aim is to contrast and to visualise the ideal world that He is trying to create for She in order for her to recover fully. “Become the green,” he says, as she’s lying down in the grass, and so she does. "Don't worry, I brushed beforehand." Hidden beneath that grass is an undertone of horror. It’s not horror in the classic film sense, but in the horrific sense. At some parts of the film, there was a huge amount of horrific things that happens. It’s somewhat related to the pain I talked about earlier, but that was painful. This is horrific. Not scary, a momentary burst of…well, being scared, but a slower burn of…fear. Yes, fear is the right word, I believe, for our purposes. Witness as they make love in the woods, before a clutch of hands (which seemed feminine to me; more on this later) started to crawl up from the environment surrounding them (in fact, this is the premise for the poster I selected for this post). At other moments, the fear is created from the mere stillness of the environment, from the creaks in the floorboards to the slow humming in the soundtrack. It all leads to a feeling that there is something not quite right with She, but it leads to more questions. She suffering from grief, certainly, but beyond that, some of her actions makes me question her motives and true nature. Running out of time, Jack Bauer resorted to horrific methods. On the opposite end of this reasoning deity we have She, performed with aplomb by Charlotte Gainsbourg. Wonderful, absolutely wonderful, and no matter how strong the contenders for the Oscar awards are, I can’t help but feel that perhaps someone, somewhere missed a trick by not including her there. Which reminded me that perhaps the standard for great acting nowadays is not actually great acting but how much pain the actors and actresses themselves portray on-screen. In this regard, there was certainly a lot of pain (in addition to the aforementioned scenes, I more-than-just winced at her banging her head on the toilet bowl out of grief). But why are they nameless? Are they symbolising something that specific names would merely limit? He, She, in a place (cabin) called Eden. Capital ‘H’ and ‘S’ too, which is weird to write throughout this review. The religious symbolism cannot and should not be ignored, but it leads to more questions rather than answers that truly satisfies. Is this a retelling of the story of Adam and Eve? If so, then why did She came to the conclusion that “nature is Satan’s church”? She did seem to hold nature in some reverence, and approaching it from a gender-based point of view, nature is usually associated with women. Yet nature is Satan’s church? Is she therefore evil? Several flashback scenes suggests this, one of her putting her son’s shoes on wrongly, and another implying that she could have potentially stopped her son’s death. Is this film trying to say that all women are evil? Or is it merely a movie that looks at the treatment of women at the hands of men (and then, as She gains the upper hand, the treatment of men at the hands of women)? This review could go on and on. I feel that a second viewing might even inspire certain things that didn’t come to mind at the time, that perhaps another layer of understanding could be gained by that. I wouldn’t mind so much, since, as I have mentioned before, this movie is well-acted, well-directed, and well-shot. Masterful, in fact, and certainly one that inspires a lot of thoughts. Thinking, however, is what you have to do (at least twice) before watching this. It’s a difficult movie to not just to watch, but to feel.